Fiction University: Are You Creating Complexity or Chaos in Your Writing? Are You Creating Complexity or Chaos in Your Writing? JH: A good novel has a lot of moving parts, and it's easy to think more means better. But that isn't always the case. Please help me welcome Shanna Swendson to the lecture hall today, to share some thoughts on complexity vs. chaos in our writing. 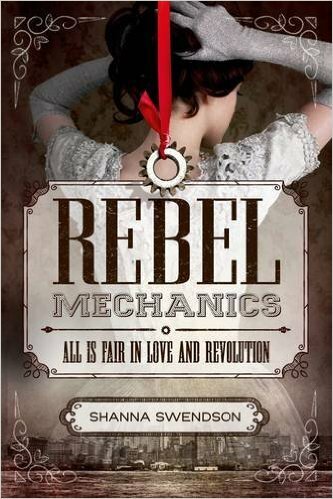 Shanna Swendson is the author of the Enchanted, Inc. and Fairy Tale contemporary fantasy series and the Rebel Mechanics steampunk series. Her next book, REBELS RISING, the third book in the Rebel Mechanics series, will be published April 4. Depth and complexity may be just what you need to make a good story great—but you have to go about adding depth and complexity in the right way. The temptation is to throw in a lot of extra stuff. The hero who’s a knight and a wizard and also a former thief who grew up as a street rat and who has issues with intimacy because of a past relationship and also authority issues—and did I mention that the evil head wizard is his former best friend?—sounds like a complex character, but what you’ve really got there is a lot of chaos. There’s so much going on there that you can never really develop it in a satisfying way, so you have a lot of superficial traits, most of which probably don’t even affect the story. You might only have the chance to touch on each trait once in the story, which means you don’t get to show different facets of these traits. With a character, you’re probably better off picking one or two key traits and then developing them fully by showing how they work in each aspect of that character’s life and how they work in relation to the plot. Take our knight—let’s pare back the traits to him just being a knight who’s a former street rat who occasionally stole to survive. Then we can really explore how that background creates internal conflict and occasionally arises to generate external conflict. Does he feel insecure as a knight because his background doesn’t match the more noble men around him? What did he have to do to become a knight, and does that affect his attitude and reputation? Do the other knights know about his past, or is that a shameful secret? Has he tried to put his past behind him, or does he still feel sympathy and kinship with people who are still in that kind of situation? Is he a knight who tries to help the underdog, or does he feel like the people who didn’t find a way out like he did are less worthy? How does this affect his relationship with his superiors? Does his background help if he has to go into the bad parts of town on a mission? On the other hand, how does he feel when he attends a royal feast? Are there situations you can put your character into that are guaranteed to create internal or external conflict for him, based on his key traits? You can get the sense of complexity out of having a variety of conflict, even if that conflict comes down to two or three main traits. If the character is in multiple kinds of situations that will cause different kinds of feelings and conflicts, we can see the complexity. We’ll see a different side of our knight tracking his quarry through the dangerous neighborhood where he grew up than we see when he’s brought face-to-face with a beautiful, high-born lady who sees him as a hero without knowing about his past. You may run into the same sort of thing with plots and subplots, where it’s tempting to make the story more complex by adding more. There’s the main quest, and then each character has a side quest, and then there are relationships among the characters, and then there’s the politics of the situation, and what’s going on with the villain, and those side plots and relationships. The result is complex, but rather chaotic. You’ll struggle to tie up all the subplots and may end up with dropped threads. It may work better to pick one or two key subplots that tie in well to the main plot and that involve most of the main characters — maybe some of the characters are involved with one subplot and the rest are involved with the other. This is when a visual tool like mind mapping can be useful so you can see the branches of the plots and where they intersect. Think about what purpose each subplot serves. Does it further character growth? Does it help set up something critical to the main plot? Does it create an obstacle or challenge toward the main plot? If a subplot doesn’t develop the characters and doesn’t really have any impact on the main plot, it may be just a distraction. You might be able to get a sense of complexity by going deep with the main plot and really exploring each character’s relationship to that goal and to the conflicts surrounding it. I’m a big fan of pen-and-paper brainstorming to help me really mine the potential in my story ideas and characters. I like to just sit and list as much as I can think of about them, then go back and group those ideas until I find key threads that I want to focus on. Then I’ll go back and do more brainstorming on those key threads until I feel like I’ve really delved into everything I can do with those ideas. There may be good material I end up putting aside because it’s unnecessary to that story, but I save the good stuff to use some other time. It may spark an additional story. Generally, I find that it works better to really develop one or two key concepts than to add additional concepts. The same idea applies to any aspect of a story in which it’s tempting to try to beef things up by adding more rather than digging deep into what you already have — goals, conflicts, motivations, cultures, magical systems, etc. Of course, there are stories that are supposed to be about chaos, but if you really look at them, you may find that the good ones still focus the sense of chaos around a few key areas, really delving into how much can go wrong based on one or two things not working properly. This is so true, Shanna. It's easy to turn the plot into chaos of we're not careful. It's the debate between quality versus quantity. Thanks. Very useful post, Shanna. Just read a brilliant fantasy where there was the complexity but the writer had avoided the chaos pitfall.